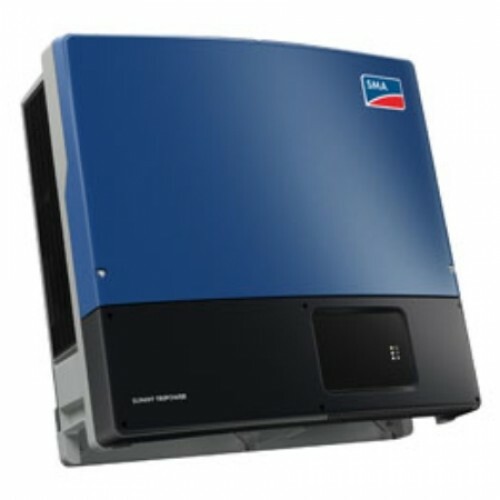 SMA's new Sunny Tripower TL-US is raising the level of performance for decentralized commercial PV plants. 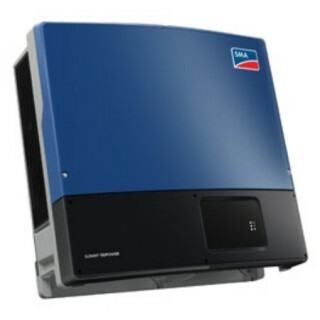 This three-phase transformerless inverter is UL listed for up to 1000 V DC maximum system voltage and has peak efficiency above 98 percent, while OptiTrac Global Peak minimizes the effects of shade for maximum energy production. The Sunny Tripower delivers a future-proof solution with full grid management, and communications and monitoring features. The Sunny Tripower is also equipped with all-pole ground fault protection and integrated AFCI for a safe, reliable solution. It offers unmatched flexibility with a wide input voltage range and two independent MPP trackers. Suitable for both 600 V DC and 1,000 V DC applications, the Sunny Tripower allows for flexible design and a lower levelized cost of energy. NOTE: The Connection Unit is an optional system component (which is included with this unit) of the Sunny Tripower TL-US series and includes combiner box and disconnect functionality in one convenient housing. Its integrated reverse polarity indicator supports safe installation. The Sunny Tripower TL-US is engineered to optimize design, production, and reliability— reducing a project's levelized cost of energy and improving its financial returns. Unmatched flexibility - Available in four power classes, the Sunny Tripower TL-US features a wide operating window, two MPP trackers, and 600 V DC or 1,000 V DC operation, making it ideal for any decentralized project. System engineering is made simple and repeatable, resulting in a shortened design cycle. Easy to transport and install, the Sunny Tripower can be mounted in a variety of ways from vertical to nearly horizontal. Concrete pads usually required by central inverters are unnecessary, preserving site real estate. Enhanced power production - Leading efficiency and SMA's proprietary OptiTrac Global Peak MPP tracking means owners benefit from superior power production and improved economics. When operated at 1,000 V DC, balance of system costs can also be significantly reduced. The Sunny Tripower TL-US also features advanced diagnostics, including a reverse polarity indicator via the Connection Unit 1000-US. Future proof - The Sunny Tripower TL-US includes a number of technologies designed to meet tomorrow's requirements. Full grid management functionality is available, as are cutting edge communication options like SMA's Cluster Controller and Speedwire. SMA Service can also simplify long-term planning with comprehensive packages covering inverters through plant-wide operations and maintenance (O&M). And, as a decentralized technology, inverterlevel O&M is reduced from the beginning compared to centralized architecture. Optimized cost - The Sunny Tripower TL-US allows integrators to optimally use real estate, shorten design and installation time, and produce more power. Inverter-level O&M is reduced through string technology and long-term support is made simple through SMA's service organization, making the Sunny Tripower TL-US the ultimate solution for decentralized PV.